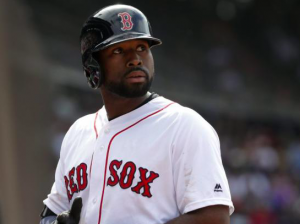 As they look to hold onto their lead atop the AL East, the Boston Red Sox have lost Jackie Bradley Jr. for the foreseeable future. However, within hours of placing him on the DL, the Red Sox found a replacement. The Red Sox placed Bradley on the 10-day DL with a sprained left thumb prior to Wednesday’s game against the Indians. But before that game was over, the Red Sox acquired Rajai Davis from the Oakland Athletics for minor league outfielder Rafael Rincones. Bradley injured his thumb while sliding into home plate during Tuesday’s game. He was in obvious pain at the time, but the injury could have turned out worse. An MRI showed no fractures or tears in Bradley’s thumb. That being said, the Red Sox don’t have a timeline for how long he’ll be out. With Bradley out for the foreseeable future, the Red Sox are lacking in outfield depth heading down the stretch. Andrew Benintendi is slated to slide over to center field, with Chris Young playing in left on a regular basis. But the Red Sox have no other true outfielders on the roster. However, after learning of Bradley’s injury, Boston president of baseball operations Dave Dombrowski moved quickly to rectify the situation and acquire Davis from Oakland. Dombrowski was already targeting Davis as a player who could add speed to the Red Sox roster. When the injury to Bradley occurred, he simply intensified trade talks. The 36-year old Davis is having a bit of a down season in Oakland after playing a complementary role in helping the Indians reach the World Series last year. However, he still has good speed, stealing 26 bases this season. He’s also capable of playing all three outfield positions. Speed and outfield depth are two things the Red Sox could use right about now. Dombrowski is also optimistic that Davis will be able to help in other ways as well. It’s unclear how much playing time Davis will get with the Red Sox. As long as Bradley is on the DL, he should get regular at-bats. Nevertheless, Davis is excited to be playing close to his home in Connecticut and to be joining a pennant race. At some point in September, the Red Sox figure to get Bradley back from the DL. Having Davis around until then should help Boston survive his absence. It may also not hurt the Red Sox to have a player like Davis around once the postseason starts, making this a small but potentially important trade.